Archispirostreptus Gigas, the giant African millipede, is one of the largest millipedes, growing up to 38.5 centimetres (15.2 in) in length, 67 millimetres (2.6 in) in circumference. It has approximately 256 legs, although the number of legs changes with each moulting so it can vary according to each individual. It is a widespread species in lowland parts of East Africa, from Mozambique to Kenya, but rarely reaches altitudes above 1,000 metres (3,300 ft). It lives mostly in forests, but can also be found in areas of coastal habitat which contain at least a few trees. It is known in Zulu as amashongololo. It is also native to Southern Arabia, especially in Dhofar. Archispirostreptus gigas is black in colour, and is often kept as a pet. In general, giant millipedes have a life expectancy of about 5–7 years. Giant millipedes have two main modes of defence if they feel threatened: curling into a tight spiral exposing only the hard exoskeleton, and secretion of an irritating liquid from pores on their body. This liquid can be harmful if introduced into the eyes or mouth. Giant African millipedes are primarily nocturnal, preferring dark, damp areas where they can spend their time foraging and eating. They move their strong legs in a wave-like motion to burrow under leaves and other organic matter. 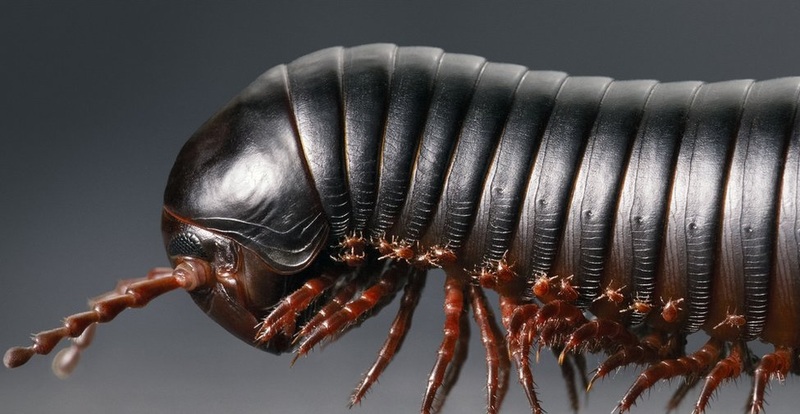 Giant African millipedes have a symbiotic relationship with mites which live on their exoskeleton and near their legs. They provide the mites with a home and food, and the mites keep the millipede’s exoskeleton clean by eating debris off of it. These mites are harmless to people. There are over 1000 species of millipedes worldwide. Click HERE for a Giant African Millipede care sheet.